Proceeds from Zombieworld go to a good cause, but this haunt is foreboding no matter the reason. Long Island is in the dead of Halloween season and residents looking for a good scare need not search very far, as the Island is now full of fantastic haunted houses waiting for their next victims to walk through the door. One of the highlights of this year is Zombieworld–the fourth annual iteration of the Deer Park Community Center’s haunted house, located at 41 Homer Avenue in Deer Park. Spanning over 7,000 square feet, this haunt is packed full of ghouls and monsters ready to terrify each and every person who walks through their doors. All of the actors are volunteers, and the proceeds for the haunt go directly into funding the town’s community center. Over 40 kids from the area, most of them high school aged, have come out to work Zombieworld this year, and their youth and enthusiasm is apparent throughout the entire house. Upon arrival you may be greeted by a somewhat long line, as the haunt has established quite a name for itself and continues to draw a substantial crowd, but the workers keep the throng moving at a steady pace and a few demonic clowns might even slip out to scare the line from time to time, making the wait all the easier as the actors ramp up their quarry’s anticipation. Once inside you are cast into the darkness, declared “fresh meat” for the zombies who lurk throughout the building. All sorts of unsavory individuals wait around every corner, letting loose bloodcurdling screams as they sneak up behind you or leap out from their hiding spots—again, the energy of these costume-clad kids is quite impressive, that they can keep up such terrifying vigor all night long is nothing short of astonishing. The whole walk is a little disorienting; it is dark, as a haunted house should be, and heavy use of strobe lights keeps patrons distracted as the undead jump from every crevice in the halls of the old school building (unfortunately the lights will make this haunt a difficult one for those with epilepsy or similar conditions to get through, but they contribute mightily to the house’s atmosphere and scare factor). In the first room a low ceiling narrows what little line of sight exists even further, and a group of robed individuals chant ancient incantations. A few of them were rather talkative on the night our party visited, inviting us to sit down by a spit roast which illuminated a creepy woodland scene—they were actually quite endearing as far as people who want to eat your flesh go. The haunt sprawls out into several different scenes after the first room, including a barnyard area and a defunct carnival chock full of deranged clowns. Among the creepier characters are several contorted bodies walking backward on all fours; these actors need not even scream or jump out at the trespassers, they’re unequivocally spine-chilling on their own. That all the funds generated by this haunt go to a worthy cause is certainly reason to consider paying it a visit, however, Zombieworld is outright scary enough to make a great evening no matter what the reason. The actors may be volunteers, but if you dare enter this house they will horrify your party like their lives (or yours) depend on it. For reviews of other LI Haunts click here. 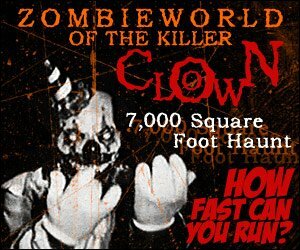 For more information on Zombieworld including hours, pricing, and location, click here! Subject: LongIsland.com - Your Name sent you Article details of "Zombieworld: A Peek Inside the Petrifying Domain of Deer Park’s Scariest Denizens"